Wintertime. 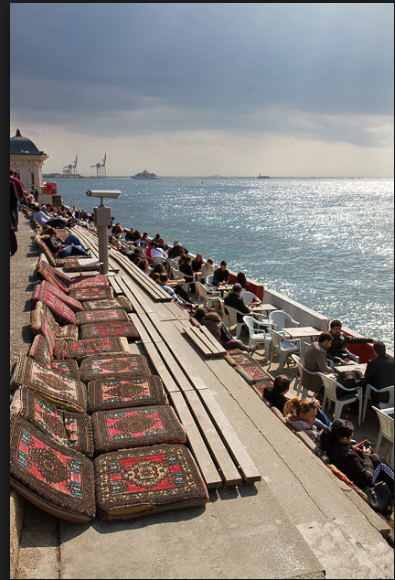 The restaurant/tea garden spot at the wildly popular Topaki Palace Park over looks the shipping lanes of the Bosphorus Strait. PillartoPost.org photo. 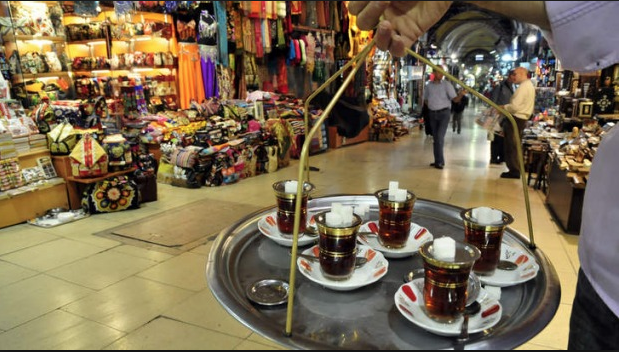 GUEST BLOG / By Angel Galland, Weaver’s Coffee & Tea staffer/writer--The çay bahçesi or tea garden is an integral and ubiquitous aspect of Turkish social life. Typically sprawling, often informal and always reasonably priced, tea gardens demonstrate that the most enjoyable pleasures are also the simplest. While every restaurant in the city serves tea, tea gardens vary little in terms of tea, service or outdoor furniture, they are distinguished by their location. Istanbul’s most vibrant tea gardens are those with spectacular views and atmospheric settings – explore as many as you can. Aptly named after the ‘nose of the palace’, this tea garden (above) offers a sultan’s view of the Bosphorus from the tip of the historic peninsula. Sitting in the shadow of the iconic Topkapı Palace, the only drawback of Sarayburnu Çay Bahçesi’s location would be its proximity to tourist sites. Nonetheless, the garden offers one of the rare views from the historic peninsula, and provides respite for weary sightseers and those wishing to see the Bosphorus from every possible angle. 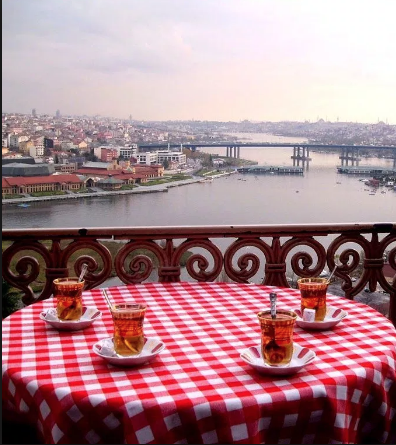 Located in one of Istanbul’s most historic and culturally charged spots is Pierre Loti (above), known both as a popular tea garden and as the dwelling place of the French novelist by the same name. The contrasting environment characterizing the area could not be more pronounced – at the bottom of the hill lies the Eyüp Sultan Mosque, one of the most important pilgrimage sites in Turkey, where a companion of the Prophet Muhammad is thought to have been buried after the unsuccessful Arab siege of Constantinople in the 7th century. Pierre Loti, on the other hand, is most famous for his vividly descriptive writing epitomized in Ayizadé, a pseudo-biographical novel featuring the French naval officer’s love affair with a Circassian harem girl while stationed in Istanbul. Today, Pierre Loti is in itself a destination, perched atop a hillside graveyard dotted with marble gravestones and swaying cypress trees. Bebek Kahve is one of Istanbul’s premiere locations to brush shoulders with high society. Their polished clientele is matched in grandeur only by the neighborhood’s sublime setting on a calm cove along the Bosporus. 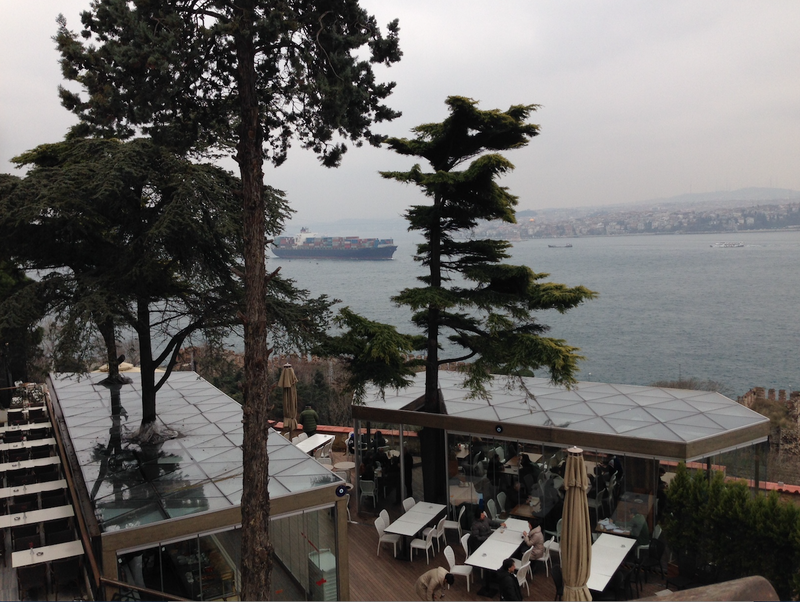 Bebek Kahve’s setting is perfect to people watch or gaze at ships traversing the Bosporus. 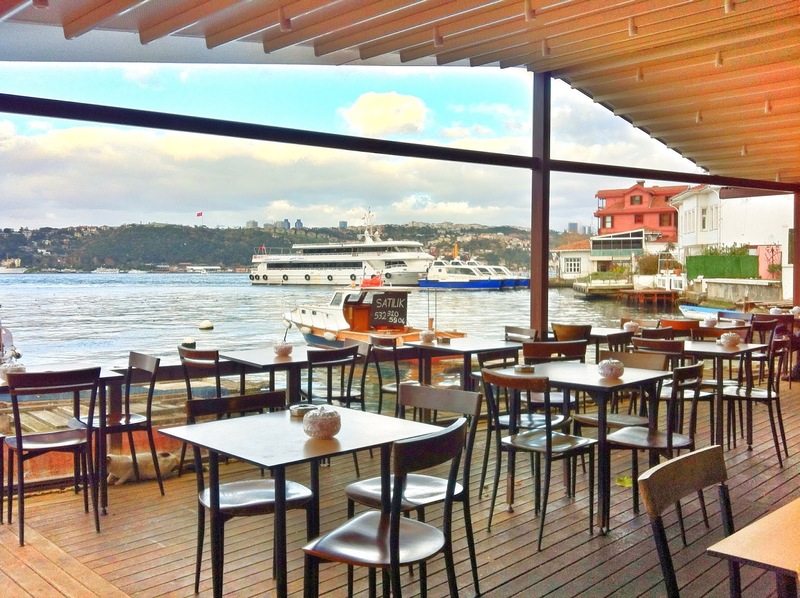 Bebek offers a vantage of beautiful nature on both sides of the water, with large houses and quaint palaces dotting the waterside. 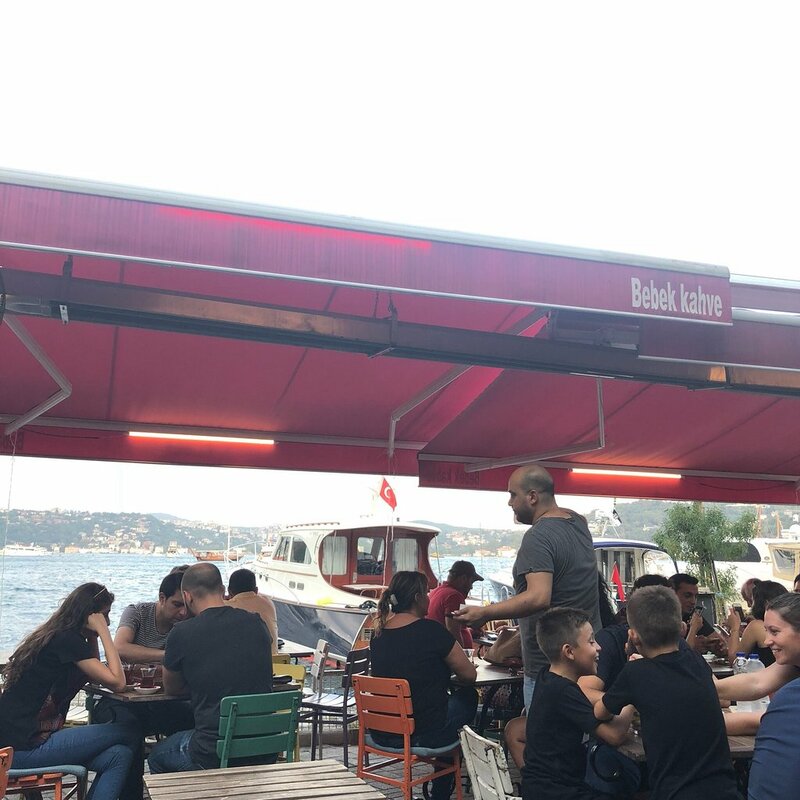 Located right on the Bosporus, patrons of the Çengelköy Çinaraltı (above) might be met with the splash of waves in their eagerness to secure the rare waterfront perch. 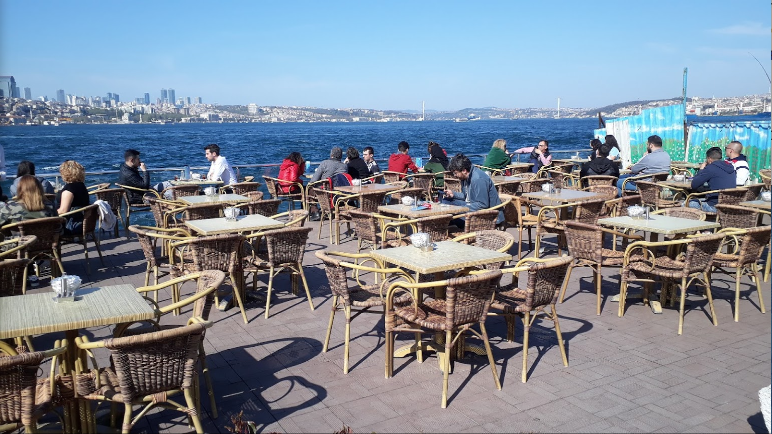 Having garnered fame as the set for many a Turkish soap opera, this cafe easily has the seating capacity for several casting crews. Open all hours of the day, the cafe takes its name from a couple of hundred year old sycamore trees casting shade over the massive grounds. With it’s royal aura, and a privatized waterfront nestled in the shadow of a beautiful marble clock tower at the gates of The Dolmabahçe Palace, this tea garden is an ideal spot to take in the sunrise as it envelopes the horizon of the Marmara Sea and the Prince’s Islands in the distance. The Dolmabahçe’s tea garden is also a relaxing place to take in the atmosphere of the Ottoman dynasty’s first attempt to create a Westernized palace along the Bosporus waterfront. 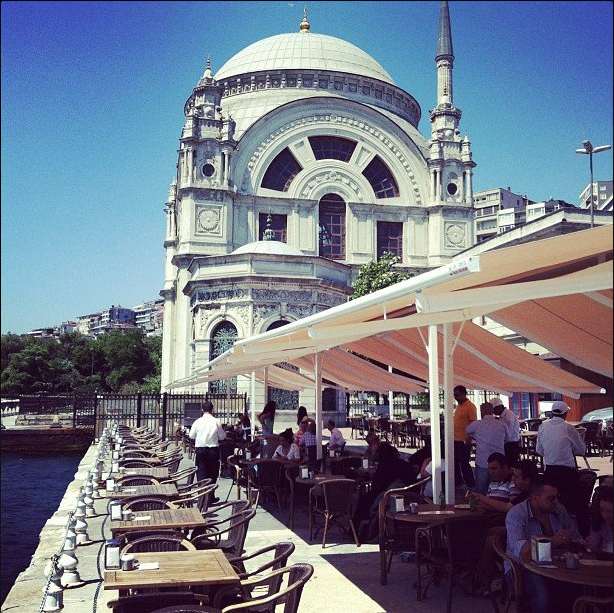 Istanbul’s most fashionable spot to sip tea is a crowded garden tucked behind the 500-year old Firuzağa Mosque. 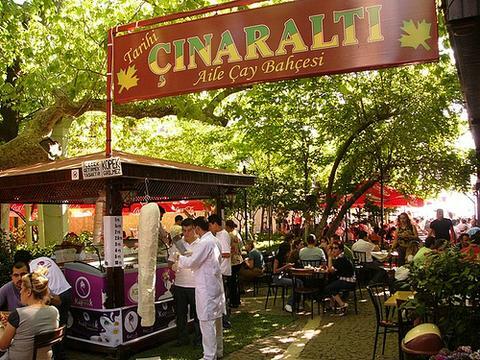 Known by locals simply as çaycı or the tea server, Firuzağa Kahvesi sits on the corner of one of the busiest intersections, connecting the trendy Cihangir neighborhood to Istanbul’s arterial Taksim Square. Firuzağa Kahvesi is a surprisingly democratic cornerstone to Cihangir’s otherwise elite range of trendy restaurants, cafes and coiffeurs. Old neighborhood residents, chic young Turks and many of Istanbul’s expats flock to this bustling tea garden. A sprawling tea garden perched on a hill above the Bosphorus, Moda’s tea garden is one of the city’s most popular destinations. A scenic ferry boat ride away from the bustling hubs of the historic peninsula, Galata and Taksim, Moda and its environs are a welcome alternative to Istanbul’s busy central district and its tea garden is perhaps one of the most serene parts of inner-city Istanbul. Like the neighborhood which it adjoins, Moda Çay Bahçesi is calm yet cosmopolitan, with a westward facing view of the Marmara Sea, ideal for sunsets and Sunday afternoons. Named after a 17th century Safavid Persian army commander who resettled in Istanbul, Emirgan has served as a relaxing garden (above) repose for centuries. Today, the historic ambiance of the locale lives on in the Emirgan Park and the adjacent tea garden with views of the second bridge crossing the Bosphorus. Nearby is the Sakıp Sabancı Museum, famous for its collection of traditional Turkish art. For Istanbul’s most breathtaking panorama, look no further than the modest stairs sandwiched between the seaside road and the Bosphorus’ lapping waters along the Üsküdar waterfront. These stairs leading down to the water are furnished with pillows and cushions to add some comfort to the cement corniche, while attendants shuttle back and forth offering simple drinks and snacks to customers. 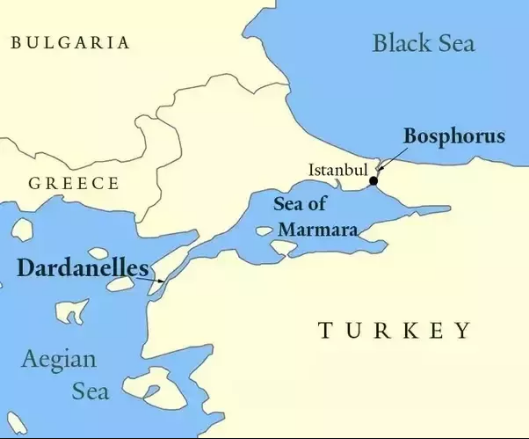 Located directly opposite the historic peninsula and Galata, this waterfront hangout boasts a beautiful landscape beginning with the Maiden’s Tower, stretching from the spires of the Hagia Sophia and Blue Mosque, along the spine of the historic peninsula, over to the Galata Tower and eventually to Taksim Square and the bright silhouettes of skyscrapers in the distance. Weaver’s Coffee and Tea blog. 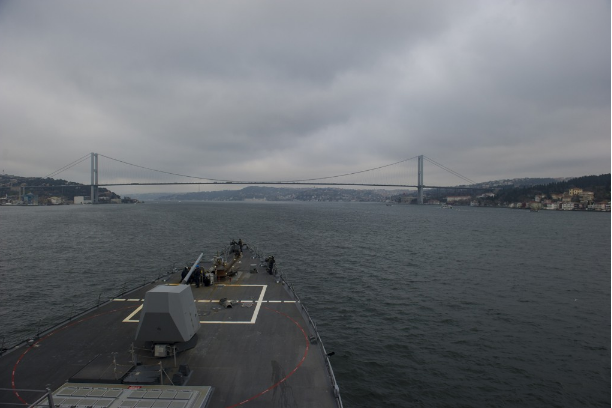 The Arleigh Burke-class guided-missile destroyer USS Truxtun (DDG 103) transits the Bosphorus Strait.